When you are in a relationship with a Hollywood star, you equally become famous in your own right. However, when you are romantically linked to the Black Panther himself, then you are catapulted to another level of stardom. This is the case with Taylor Simone Ledward. She is the lady in Chadwick Boseman’s life. For those who may not know, Chadwick Boseman portrayed the iconic superhero Black Panther/T’Challa. Black Panther was unarguably the biggest movie of 2018 and is one of the highest grossing films ever. Want to know more about Taylor Simone Ledward? We have all the details here. Taylor Simone Ledward was born in the year 1991. Her nationality is American and a quick glance at her features will reveal that she has African-American, as well as Asian ancestry. She is therefore Blasian. There is not much information about Ledward’s family background. There are no details about her parents’ names or their occupations. However, some diligent investigations revealed that she has a sister, as well as a beloved granny. With regards to her educational history, Taylor Simone Ledward is well educated. She has an associate degree in Sociology and also studied Music Industry at the California State Polytechnic and received her degree in 2014. Taylor Simone Ledward is a talented singer and videos of her singing can be found on YouTube. Her love for music dates back to her childhood. She was a member of her school’s jazz band while she was in college. She also reportedly served as the chair of her school’s music board between 2012 and 2013. The talented Ledward obviously aspires to make a career in music. She has undergone internships at various organizations in order to achieve her dreams. Additionally, she performed as part of an orchestra in the past. Is She Married To Chadwick Boseman? Before we delve into Ledward’s relationship with Boseman, it is proper to get some background information on the man himself. Chadwick Aaron Boseman was born on the 29th of November 1979 in Anderson, South Carolina. He hails from a family of five. His father’s name is Leroy while his mother’s name is Carolyn. He has two elder brothers -Derrick (a pastor) and Kevin (a professional dancer). Boseman studied directing at Howard University and graduated in 2000. He also attended a theatre program at the University of Oxford. The summer program was financed by Oscar winner, Denzel Washington. Chadwick Boseman began his career in 2003. Since then, he has featured in many movies such as 42, Get on Up and Marshall. His biggest role is unarguable as the superhero, T’Challa, in Black Panther. He plays the leader of a prosperous African kingdom, Wakanda, trying to protect itself from imperialism. The movie shattered numerous box office records and is the 9th highest grossing film of all time. Taylor Simone Ledward and Chadwick Boseman reportedly started dating in 2015. Even though they are yet to officially confirm it, it’s not hard to see that they are a couple. Ledward has been by Boseman’s side throughout the fanfare associated with the premier of Black Panther. She has also accompanied her man to many red carpet events. 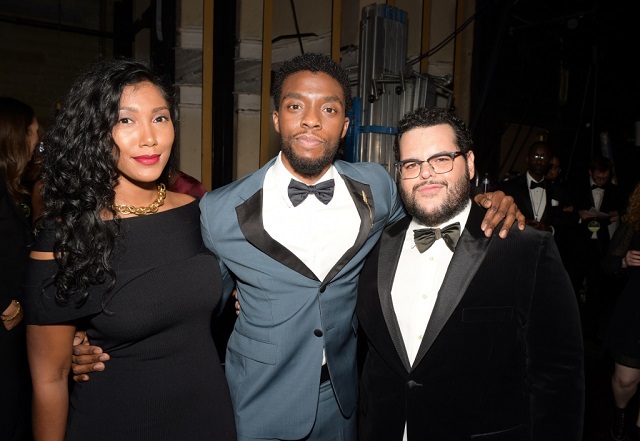 The Black Panther movie notably received several nominations at all the major awards including the SAGs, The Golden Globes and Oscars. Ledward and her beau were also seen together at the NBA All-Star game in 2018. Even though the couple are keeping mum about their relationship, their family members are not as circumspect. When In Touch Weekly Magazine contacted Ledward’s grandma in April 2018, she revealed that the two were very happy and that they both respect each other. Notwithstanding, they are yet to tie the knot officially. Taylor Simone Ledward is 5 feet 4 inches tall (1.61m) and weighs 56 kg or 124lb. Her general body measurements are chest – 34 inches, waist – 27 inches and hips – 35 inches. The stunning beauty also has black eyes and jet black hair. If Ledward and her beau decide to have babies someday, they will definitely make beautiful ones. Ledward is a gorgeous lady and boasts a stunning heart-shaped face. Her beau is also not lacking in the looks department.